Interview with C.A Szarek + Excerpt + Contest! She’s also offering on lucky commenter here at The Book Tart a swag pack or ebook! Just use the rafflecopter and leave a comment telling us about any fun talents you have. I can curl my tongue and sing a lot of show tunes. *nods* those are talents! Me: C.A.! Hey beautiful! Come on in and take a turn on my hot seat. I mean, sit down on my virtual couch. 😀 Can I get you something to drink? Water, tea, coffee, soda…. Something celebratory? C.A. : Hmm….I am a COFFEE FANATIC! COFFEE COFFEE COFFEE! Oh, I suppose I should say thanx. Hehehe. Thanx for having me and thanx for the Coffee. C.A. : So, I love chocolate, too. How did you know? So…. You are a storyteller and from what I’ve seen you play in lots of genres. Which I love by the way. I READ lots of genres. Tell me a bit about what you’re working on and your newest release Sword’s Call. C.A. : I kinda write whatever occurs to me. I’ve never *worried* about genre. I love fantasy, so I see me continuing that. I also have a romantic suspense that will be available for pre-order May 20 and general release July 1. I am really excited about it, as much as Sword’s Call. It’s called Collision Force and it’s also the first book in a series called Crossing Forces. I am addicted to series, both writing and reading! FBad boy FBI agent and feisty widowed police detective collide pursuing a human trafficker in small town Texas on their way to true love. C.A. : As for what I’m working on now, I *just* finished Love’s Call (King’s Riders Book Two) so that is a relief! It took me so long it was getting to the point I didn’t like it anymore! Talk about stress. It will release late 2013 or early 2014. I have too whip out 3 chapters of a story I started some time ago (I have about 28 pages) and it’s paranormal…contemporary, and a first for me. It’s about wolf-shifters, and I would like to enter it into a contest. I am excited about writing new words (editing is my NEMESIS) so I don’t think it will take me very long. I am in love with my wolves, so I hope they will be happy they get a little bit of spot light. Then…like in a matter of weeks, I need to start the second book in the Crossing Forces book 2, it’s called Chance Collision. Phew. Looks like I am gonna be BUSY! Me: Oh My Goodness! Hon… You are super duper busy. I am thrilled for us though! 😀 More King’s Riders, Crossing Forces PLUS wolf shifters? Yum! How could you compare your writing process to playing on a trampoline? C.A. : Parsleet: (noun) A curse; or cuss word utilized to showcase the frustration of a writer. “I wish I was done with this book! It’s such a fricking parsleet!” Hehehe. That might be a lil lame, but it’s the first thing that came to mind, so I went with it! Me: *snort* I like it! Parsleet! LOL OK, here’s your madlibs…..
You’re so SOFTLY wonderful that it’s bound to happen: A knock on your front FOOT, and there he is, with his LARGE eyes and an armful of ARMS. He tells you he’s missed you BARELY and can’t RUN without you. He realizes he made a complete HEAD of himself and wants to CARESS back together. Do you love him still? Only you know the LONG answer, but remember that only five FINGERS ago he RAN out on you and broke your TOE. Does he really want to get back together or is he just looking for a place to hang his BED? What talents do you have? (like curling your tongue or juggling!) Yes, I can curl my tongue. What’s your favorite joke? Hmmm….nothing comes to mind. Do you prefer green or red grapes? Red, it’s all about the sweet, baby. If you could learn any language fluently what would it be? Japanese. I know some understand even more, but’s hard to form sentences. Me: Thanks darlin’! I’m so happy you came to play with me. Come back anytime k? PS. Don’t forget to enter the contest for a chance to win prizes from C.A.! *points down* see?! For generations, the Ryhans, ruling family of the Province of Greenwald, have been keepers of a sword rumored to possess enough magic to defeat kings. Lord Varthan, a former archduke and betrayer of the king, covets the sword and invades Greenwald. Lady Ceralda Ryhan, daughter of the murdered duke, gains the sword and flees, trusting only her white wolf, Trikser-magically bonded to her. Cera needs nothing more to aid in her fight. Jorrin Aldern, half elfin and half human, left his home in the mountains of Aramour to find his human father who disappeared twenty turns before, but finds Cera with Varthan and his shades on her tail instead. His dual heritage and empathic magic will tempt Cera in ways she never thought she’d desire. But can he convince her trust and love can pave the path to redemption-or will the epic battle end in tragedy, and evil conquer them all? “Tell me about it,” Jorrin encouraged. “His eyesight is so sharp. It was a wonder to see.” Their eyes locked and held. Air ruffled her hair, causing gooseflesh to rise on her neck as a substantial breeze kicked up. Trikser made a noise in his throat but she ignored him. Jorrin looked so wild and beautiful with the wind in his dark hair, his high cheekbones flushed with color to the tips of his slender tapered ears. Her heart skipped as his blue eyes darkened and she read intense heat there. Last night he’d been in her dreams. Try as she might, Cera could no longer deny that she was attracted to him. That she’d liked that kiss he stole what seemed ages ago. Would he kiss her again? Heat crept up her neck and burned her cheeks. The way he was looking at her right then made her lose her train of thought and her worries. “What?” But Cera already sent the mental command. Her bond slipped off her lap with little encouragement. He’d caught sight of a rabbit, and took off after it. Jorrin grabbed her hand and tugged forward. She fell onto his lap, moving to him instead of away, ignoring mental cautions that this wasn’t a good idea, despite her dreams, her admitted attraction. Their lips met in heated rushed. Cera’s arms shot around his neck and she pressed closer. His body was hard against hers and a tremor shot down her spine. When she touched her tongue to his, he moaned, his hands shooting down to cup her bottom. Cera wiggled in his arms as an unfamiliar warmth enveloped her like an embrace. Jorrin’s erection pressed into her hip and she clutched his tunic with both hands. When he kissed her harder, her head spun. Feeling his urgency, confusion rushed her. She moaned, fighting the sensation of his warmth, his strength as he squeezed her against him. Her desire for more. Her desire for him. She couldn’t lose control. Yanking back, she panted against him. Jorrin’s chest heaved into her breasts as they both struggled for breath. “What’s wrong?” he croaked. Author of fantasy, paranormal, romantic suspense and the occasional YA. Sword’s Call (King’s Riders Book One) AVAILABLE NOW from Gypsy Shadow Publishing! 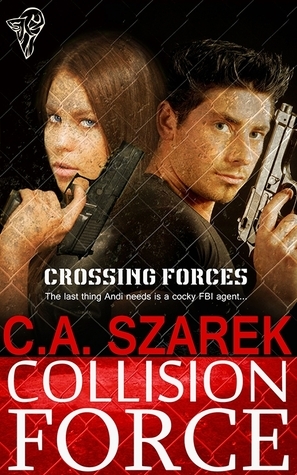 Collision Force (Crossing Forces Book One) releases July1, 2013 from Total-E-Bound Publishing! or an e-book of Sword’s Call. Thank you so much for having me today! This was so much fun! Really! *Kermit Flails* Oh! Oh! Anytime 😀 You are a delight and I’m happy to have you eat pie, talk books and play with me anytime! LOL Lois that made me laugh! I can flare mine like a bunny rabbit! I love your talent! lol that is very cool! OMG – I don’t think I have any cool talents! **thinking, thinking…** Ohhhh…well, I better keep that one to myself. 🙂 I’m pretty good at talking like Dolly Parton and I can drive the hell out of a dirt road. Lol!!! I love Dolly Parton!!! I can roll my tongue, I can’t think of anything else. I can write (legibly) with either hand or either foot. Thank you for the opportunity.